Some projects capture our imagination at first sight. Here, we were greeted with a stunning, contemporary house; a deep, creek-side urban lot and a client with abundant plant knowledge and design savvy. We were intrigued by the challenge of marrying the strong architecture of the house with the naturalistic garden that the site and our clients encouraged. 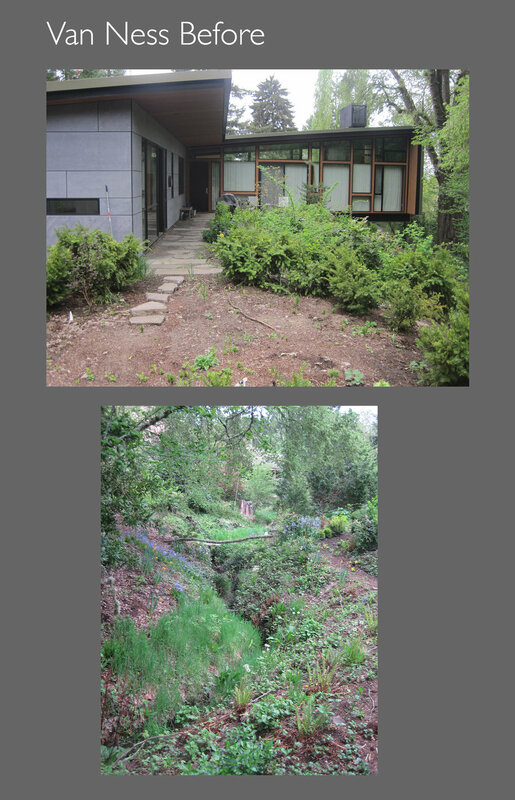 The site’s steeply sloping hillsides left little space for outdoor seating near the house. It seemed a shame to cram a couple of chairs against the house, but no one wanted hardscape to dominate the natural terrain. Our solution was a thin steel retaining wall with flagstone set to its edge, which created an ample outdoor living room that echoes the lines of the house while seeming to float over natural grades and flowing plantings. A vegetable garden near the house is the perfect spot to transition from architectural lines to the naturalistic landscape. A four foot diameter rusting steel sphere at the center of that space is a focal point from the house and center of a stone-bordered roundabout, after which all paths began to follow the rolling terrain of the creekside property. Outdoor living spaces, like a creek-side bench, a hammock and a floating deck tuck into the garden, offering destinations and new perspectives on the space. 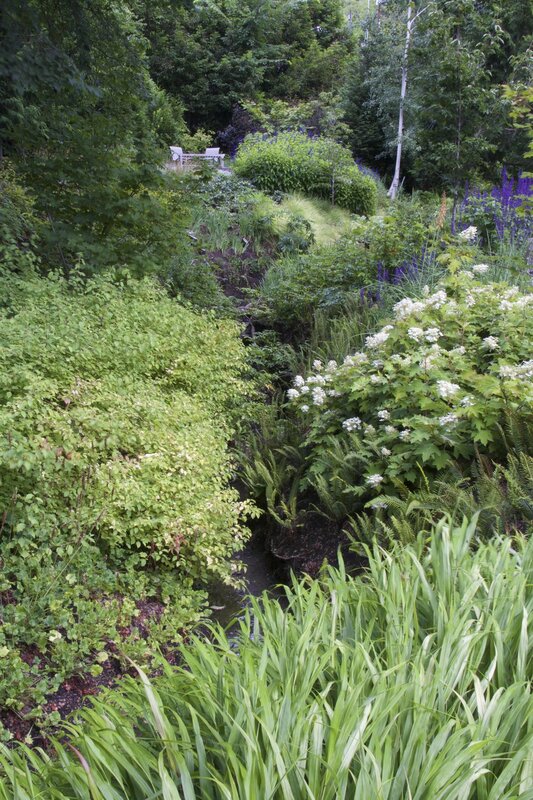 Large masses of plants interweave under elm trees and over the steep banks of the creek. 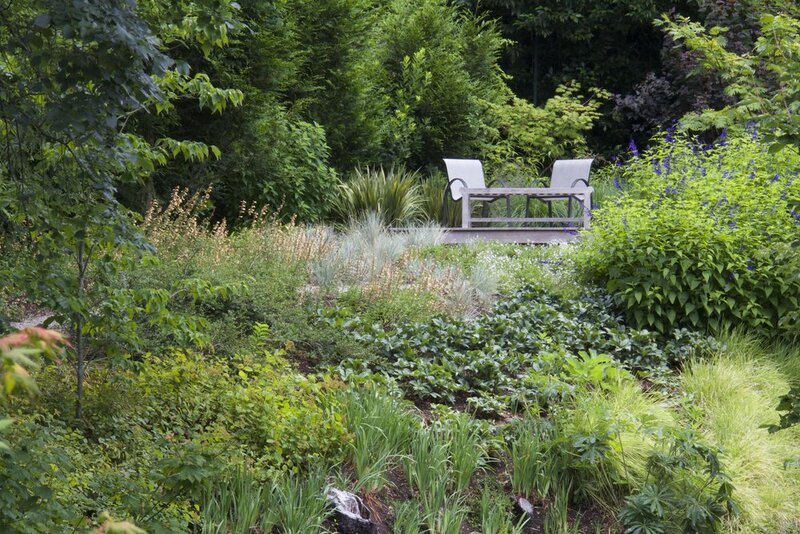 Selected for low water demands and vigor in the climate of the Willamette Valley, the palette ranges from Oregon natives to vigorous flowering perennials that attract swarms of hummingbirds and other pollinators.